Manchester United manager Jose Mourinho has explained how he plans to use young defender Diogo Dalot in upcoming games. The 19-year-old made a hugely impressive debut at right-back for the Red Devils in their Champions League win over Young Boys in midweek. However, Mourinho has now gone on record as saying he doesn’t plan to use Dalot from the start against Wolves in his side’s Premier League clash this Saturday. 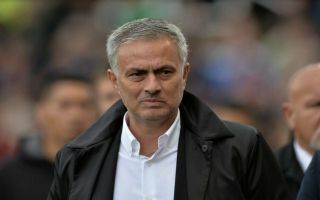 Some fans will no doubt he disappointed with this news, but Mourinho has given a fairly sensible explanation for this decision and explained his plan to ease the Portuguese starlet into his team. ‘I want him in this process of adaptation to play totally fresh,’ Mourinho is quoted in the Manchester Evening News. ‘So he’s not playing tomorrow, he plays Tuesday again, to play totally fresh. This likely means Antonio Valencia will be in United’s line up vs Wolves, in what is a potentially challenging and important game for the club. Nuno Santo’s newly-promoted outfit have looked good so far in the top flight, having signed a number of names due to their connections with renowned super-agent Jorge Mendes. It means Valencia will have to be at the top of his game as the ageing Ecuadorian has perhaps not always convinced everyone as the best option at right-back.